Traditionally, this food item referred to fresh or pickled vegetables that were prepared by thinly slicing them into strips and stick shapes to be served as an hors d'oeuvre. Today, a wide number of foods are considered to be Crudités when served on appetizer trays. Not only vegetables, but also fruits and breads are often included as part of a group of Crudités served during parties and events. 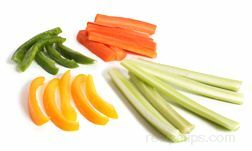 Vegetables such as carrots, celery, sweet peppers, jicma, and asparagus can all be sliced into thin strips or served as stick shapes to be prepared and placed on appetizer trays. In addition brocholli and cauliflower florets are being added to the trays and served as Crudités. Fruits such as apples or pears can be easily sliced into thin strips and are also being placed into this group of foods. Breads such as pita bread which are baked into thin pieces can be cut into strips or triangular shapes to be included as part of this appetizer grouping. When the Crudités are arranged, a sauce or dip such as a sour cream snack dip is typically placed with the appetizers to be served a flavorful accompaniment.